You will be surprised just how easy this pattern is to make using either the Ruler Revolution 3 x 3 Snowball ruler or the 4 x 4 Snowball ruler. The quilt blocks for this beautiful quilt are made by cutting larger snowballed nine- patch blocks into quarters. The quarters are then turned and arranged to make this amazing hidden snowball design. Be the creator of your own design by deciding on the way you want to turn and sew these blocks together. Or, just use our design which is fast and easy. 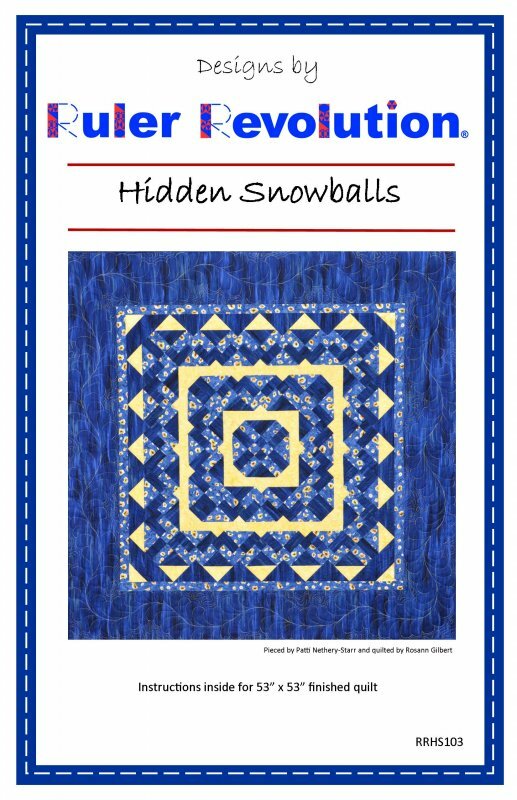 Your quilting buddies will not believe your quilt started out as a snowball block. And, the illusion that there are little pieces, is just that, an illusion as there are no small pieces to cut or sew. The smallest piece of fabric to sew is a 3 1/2 " strip.